Shrubs or small trees , to 6(-10.6) m, suckering, forming dense clumps, not aromatic and resinous. Leaves not persistent in winter; petioles 6-15(-20) mm. Leaf blade broad-elliptic to nearly rounded or obovate, 3.7-16.7 × 2.5-13 cm, base strongly oblique and rounded, sometimes somewhat cuneate and weakly oblique, apex acute to short-acuminate or broadly rounded; surfaces abaxially pale green, not glaucous. Flowers appearing in autumn, faintly fragrant; calyx adaxially yellow-green to yellow; petals pale to deep yellow, rarely reddish, 10-20 mm; staminodes conspicuously dilated. Capsules 10-14 mm. Seeds 5-9 mm. 2 n = 24. Flowering fall (Oct-Nov [Dec]). Dry woodland slopes, moist woods, bluffs, and high hammocks; 0-1500 m; N.B., N.S., Ont., Que. ; Ala., Ark., Conn., Del., D.C., Fla., Ga., Ill., Ind., Iowa, Ky., La., Maine, Md., Mass., Mich., Minn., Miss., Mo., N.H., N.J., N.Y., N.C., Ohio, Okla., Pa., R.I., S.C., Tenn., Tex., Vt., Va., W.Va., Wis. Hamamelis virginiana exhibits a complex range of variation, not easily reconciled taxonomically, especially in the leaves and flowers. In the northern part of the range, the leaves are larger, averaging 9 × 2.6 cm, the petals are bright yellow, and the plants are normally shrubby. 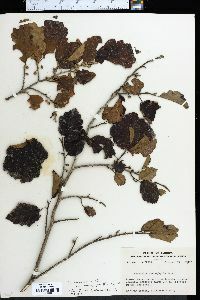 In South Carolina, Georgia, and Florida, the leaves are usually smaller, averaging 6.2 × 4.1 cm, the petals are distinctly pale yellow, and the plants sometimes attain small tree proportions, to 30 cm in trunk diameter. 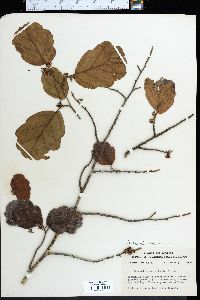 Such plants have been referred to as H . virginiana var. macrophylla . On the Ozark Plateau, H . virginiana and H . vernalis are sympatric. There the petals of H . virginiana are often reddish at the base, indicating the role of hybridization in that part of the range. 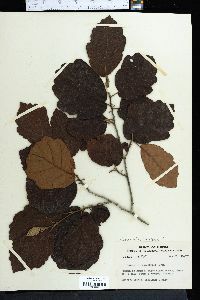 Infraspecific taxa are not recognized for H . virginiana because no consistently defined pattern of variation or geographic correlation can be identified with this plant. Hamamelis virginiana was well known as a medicinal plant by Native Americans. Cherokee, Chippewa, Iroquois, Menominee, Mohegan, and Potowatomi tribes used it as a cold remedy, dermatological aid, febrifuge, gynecological aid, eye medicine, kidney aid, and in other ways (D. E. Moerman 1986). Witch-hazel was subsequently used by the early European settlers in similar ways. A tea of the leaves was employed for a variety of medicinal purposes. The twigs were used as divining rods (water-witching), thus giving the vernacular name to the plant. 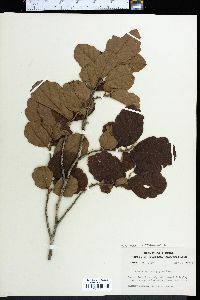 Modern uses employ both the bark and leaves, and a good demand still exists for the pleasant-smelling water of witch-hazel, derived from the leaves and bark. The products are used in skin cosmetics, shaving lotions, mouth washes, eye lotion, ointments, and soaps. Hamamelis virginiana is sometimes cultivated, largely for its autumn flowering. The largest known tree of Hamamelis virginiana , 10.6 m in height with a trunk diameter of 0.4 m, is recorded from Bedford, Virginia (American Forestry Association 1994). Shrub or small tree to 10 m tall, trunk 12 cm in diameter Leaves: alternate, stalked, medium to dark green, 10 - 15 cm long, oval and often inversely egg-shaped with an asymmetrical base, wavy teeth perpendicular to margin, sometimes hairy-veined beneath. Leaves turn yellow in fall. Flowers: either male or female, found on the same tree (monoecious), in clusters of two to four. The four petals are yellow, 1.5 - 2 cm long, strap-like, twisted or curled, and fragrant. Fruit: is a woody, two-beaked capsule, green becoming tan, 1 - 1.5 cm long, hairy, ejecting two shiny black seeds several feet after capsule ripens (usually after one year). Capsule may persist on branch for years. Twigs: zigzag, brown and hairy when young, becoming gray to brownish gray with scales developing on older branches or trunks. Terminal buds: stalked, 7 - 14 cm long, flattened, curved, lacking scales (naked), covered by yellowish brown hairs. Form: irregular and open. Flower buds: spherical, with three to four on a bent stalk. Similar species: Hamamelis virginiana is unlike any other Chicago Region species when displaying its strap-like, yellow flowers into November or December. Other distinctive characteristics are its asymmetrically based oval leaves with wavy-toothed margins, naked and stalked buds, and two-beaked capsules. Habitat and ecology: Very common on high dunes and wooded slopes, in rich woods, and along ravine slopes near Lake Michigan. Notes: Hamamelis virginiana is the latest blooming species of all Chicago Region native flora and is sometimes grown ornamentally for this reason. Water diviners use forked twigs of this species to search for underground water sources. Witch hazel astringent is extracted from the bark, roots and leaves. Etymology: Hamamelis comes from the Greek words meaning flowering and fruiting together. Virginiana means "from Virginia." Infrequent to locally common in the counties shown on the map. In some of the central and southwestern counties it is either very rare or absent. It generally grows in sandy soil in black and white oak woods and on the banks of streams. It prefers the shade of the forest or banks. The branches of this shrub are the source of commercial witch-hazel but the shrub has never been commercialized in Indiana. Shrub to 5 m; lvs broadly obovate or obovate-oblong, 5-15 cm, with several or many rounded teeth, inequilateral at the broadly rounded or subcordate base, often stellate beneath; pet spreading, 1.5-2 cm, yellow or seldom reddish; sep dull yellowish-brown within; fr ovoid or thickly ellipsoid, 1-1.5 cm, the hypanthium often bearing the persistent sep; 2n=24. Moist woods; Que. and N.S. to n. Mich. and Minn., s. to Fla. and Tex. Oct., Nov., the fr ripe a year later.